I'm a big advocate of theological non-cognitivism, sometimes known as ignosticism. It's the view that we don't really need to take theism all that seriously because the very concept of a god is ambiguously defined in the first place. Sometimes the problem cuts to the very meaning of works used to describe a god, like "mind", "cause", or even "exist"; that is, we have clear conceptualizations of these terms derived a posteriori, from our empirical experience. There are certain constraints on the coherency of these concepts, and it's often unclear what the terms mean when applied to a deity that is not composed of parts, does not exist within space and time, and possesses only agency — not other parts of the mind consistent with our empirical experience, like a cognitive subconscious and neural structure. If we would presume to contemplate theism from an intellectually honest perspective, we would try to decide what kind of universe we would expect to live in if theism were true; then we would do the same for naturalism; and finally we would compare those expectations to the real world. But when we do that we find theistic expectations failing to match reality over and over again. Now, I know perfectly well (from experience as well as from cogitation) that you can never make headway with theists by claiming “If God existed, He would do X, and He doesn’t” (where X is “prevent needless suffering,” “make His existence obvious,” “reveal useful non-trivial information to us,” “spread religious messages uniformly over the world,” etc.) Because they have always thought through these, and can come up with an explanation why God would never have done that. But these apologetic moves come at a price: they imply a notion of theism so flexible that it becomes completely ill-defined. That’s the real problem. Craig’s way of putting it is to suggest that God is “like the cosmic artist who wants to splash his canvas with extravagance of design.” That’s precisely why naturalism has pulled so far ahead of theism in the intellectual race to best model our world: because it plays by rules and provides real explanations for why the world is this way rather than that way. Let's begin by asking what, exactly, an "angel" is in the first place. Sure, we all picture some celestial being floating in the clouds, probably wearing a white robe, with white wings and a halo floating above its head. But irrespective of the speculative accuracy of artistic renditions of such beings, do we need to treat seriously the claim that they exist in the first place? 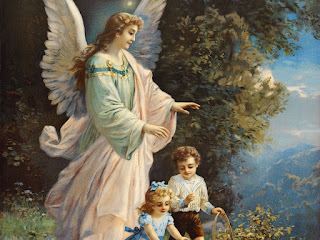 What laws, if any, govern the interaction of angels with their own world? What laws, if any, govern and constrain their interaction with our universe? What are their minds like? Do they have brains? Do they have a cognitive subconscious? If we can interact with angels, how would we distinguish the interaction with an angel from that of some other being (say, a ghost or an ancestral spirit)? I could go on (and on, and on) but the point should be clear: Contrary to Rauser's assertion, ambiguously defined concepts like angels are not claims for which skeptics need to provide defeaters. Rather, the onus is on those making the claim to clearly define the concept in the first place. Otherwise, we can't talk about evidence for or against the existence of angels because it's not even clear what angels are. Randal, apparently not even having a clear concept of what angels are in the first place, nonetheless claims they are "far more intelligent and powerful than human beings". How could he possibly know this? This is, incidentally, no different than ghosts or ancestral spirits. For example, ghosts are usually depicted as being able to move through walls. But what prevents them from falling through the Earth? How are they able to pass through some objects, but not others? If they are non-physical beings, how do they "see"? Do they interact with particles of light, as we do? If so, how? Skeptics often reply to claims like Randal's with a line something like the famous "that which can be asserted without evidence can be dismissed without evidence". That's a good rule of methodological inquiry, but it's important to recognize when conceptual ambiguity prevents evidence from even entering the discussion in the first place. This is why naturalism continues to supplant supernaturalism: naturalistic concepts can be clearly defined and yield independently verifiable predictions; supernatural concepts like angels are consistently amorphous and ambiguous, allowing them to be used only as ad hoc explanations.